Houghton Mifflin Harcourt, 9780618153107, 392pp. 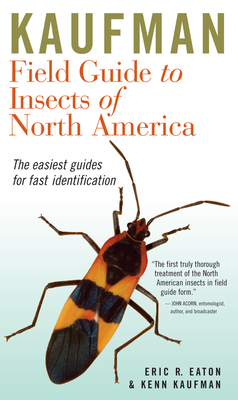 Comprehensive yet compact, authoritative yet easy to understand, this is the perfect guide for anyone who wants to know more about the fascinating and diverse insects of North America. Many insects are difficult even for the experts to identify, but here readers will find a wealth of information on the amazing observable behaviors of insects and their fascinating life histories. Naturalists Kenn Kaufman and Eric R. Eaton use a broad ecological approach rather than overly technical terms, making the book accessible and easy to use. Their lively and engaging text emphasizes the insects that are most likely to draw attention and also includes helpful details on a wide array of lesser-known but recognizable groups. The guide is lavishly illustrated, with more than 2,350 digitally enhanced photographs representing every major group of insects found in North America north of Mexico. Eric R. Eaton is a writer specializing in natural history. He has worked as an entomologist for the Cincinnati Zoo and on contract for the Smithsonian Institution, Portland State University, and other clients. He has contributed to books and written numerous articles for popular magazines. KENN KAUFMAN, originator of the Kaufman Field Guide series, is one of the world’s foremost naturalists.